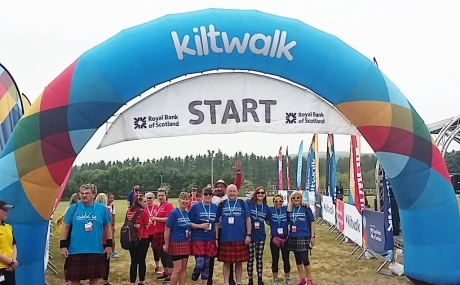 Join us for the Aberdeen Kiltwalk 2019 to raise vital funds for women's health research at the University of Aberdeen. All Kiltwalk fundraising will receive a massive 40% boost from The Hunter Foundation, meaning that we will receive £1.40 for every £1.00 that you raise! We will give you a free place to take part - we just ask that you raise a minimum of £50. For your free place you will need a discount code - please get in touch with Lynne Black at lynne.black@abdn.ac.uk before you register on the Kiltwalk Website. In March 2018 the Aberdeen Centre for Women's Health Research was opened by Her Excellency Dr Sheikha Aisha Bint Faleh Al Thani. We are raising vital funds to help the centre achieve its mission of excellence in research across the spectrum of women's health, including fertility, pregnancy, pelvic issues, menstrual disorders and pre-cancerous conditions. The Centre for Women's Health Research Centre will be based in the forthcoming £167 million Baird Family Hospital and Anchor Centre within the Foresterhill health campus. With dedicated facilities within the new Baird Family Hospital, the Aberdeens Women Health Research Centre will bring together clinical and non-clinical researchers alongside the clinical team to generate the answers to important questions in women's health.